Father Time and colleges are. In December, the U.S. participation rate—that's the share of the working-age population that's working or looking to work—dropped to its lowest percentage in four decades. In Washington, bad news means somebody must be blamed, so some Republicans (e.g. : Rep. Lynn Jenkins and Rep. Marsha Blackburn) have decided that someone is President Obama. Unlike the country's high unemployment and slow job-creation, our low participation rate (the lowest since 1978, to be exact) is sometimes considered something of a mystery. But upon examination, it's really not that mysterious. The recession has discouraged many people from looking for a job and encouraged marginal workers to find other things to do with their time, like care for their kids. But most of the decline appears to be the predictable result of an aging country that is waiting longer to enter the workforce because we're spending more time in school. And, since one of those things (aging) is inevitable and the other (school) is arguably good, it's hard to see how the low participation rate is the president's fault. In a way, this graph below—which, at first glance, seems innocuous and even a little boring—offers a perfect solution to the participation puzzle. It shows that young people are working less (because they're in school) and it shows that old people are working more than they used to, but still much less than other workers (because they're retired). Imagine a group of people—a generation—moving along the tops of these columns, from young to old, left to right. As that generation ages, it passes over Participation Mountain, reaching its employment peak, between 25 and 54, and falling swiftly into retirement in their 60s. The workforce is graying with the boomers. Since 1992, the typical worker's age has increased from 37 to 42, while the share of the labor force over 55 has increased by 77 percent. 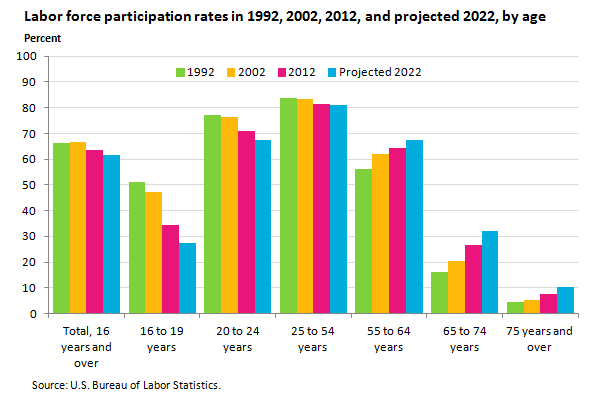 How much of the participation decline is plain-old demographics? It's a tricky question, but let's use some really simple math. Let's assume that the percentage of people working within every cohort (16-24; 25-54; 55-64; and 65+) never ever changed. Let's take the 1992 participation rate, apply it to each cohort in 2012, and see how close we get to the actual rate today. In this alternative universe, participation would have still declined from 66.4 percent to 64 percent, because more people would have retired. (That 2.4-percentage-point decline equals about two-thirds of the dip in our actual participation rate. 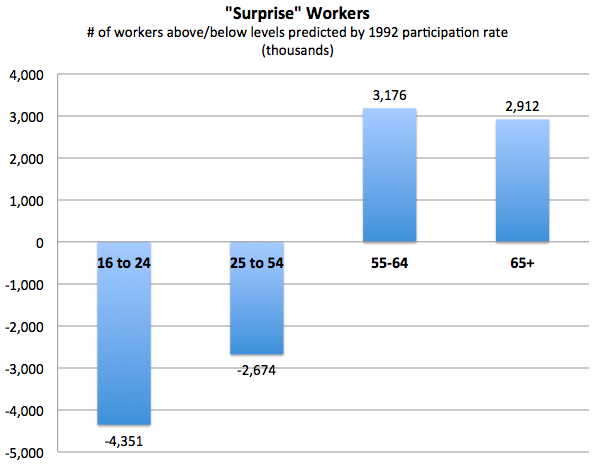 *) Even more surprisingly, we have about 6 million more workers over 55 than you'd predict by crudely applying 1992 participation rates to the population. The place where we're really missing workers is in the 16-24 cohort, where there's a 4.3-million-person hole. What accounts for it? School, mostly. After demographics, the decline in participation among young people is, by far, the leading factor in the overall decline in participation. If we raised our participation rate to 1992 levels today, the labor force would grow immediately by 6.7 million people—and, as you see, 4.3 million of those workers would be under 24. The "missing workers" in the economy are mostly young. And they're mostly in high school or college. Education enrollment jumped four percentage points in the four years after the recession started, "essentially accounting for nearly all of the decline in the youth [participation]," according to a 2013 paper by Christopher J. Erceg and Andrew T. Levin. Higher college enrollment also accounted for about one-third of the decline among prime-age workers (25-54), too. 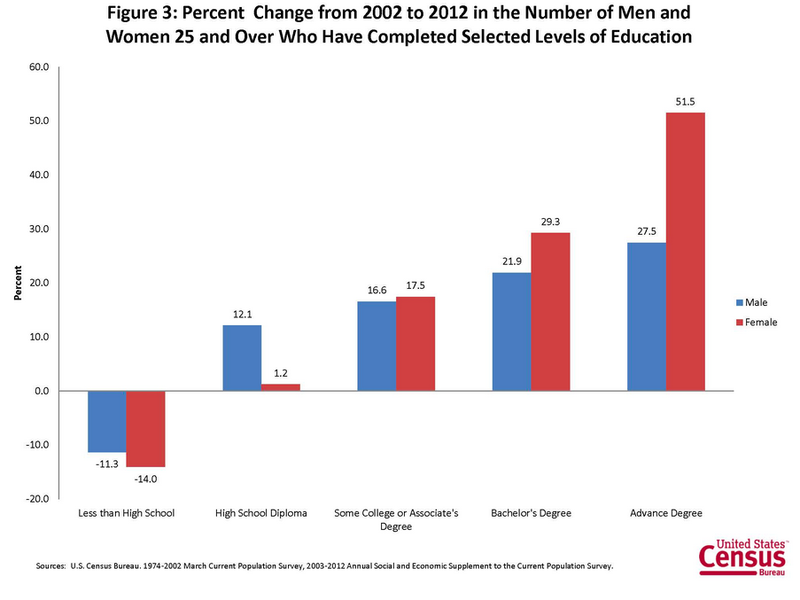 As you can see, high-school and college completion are soaring, and people in school are considerably less likely work. The recession, too, has affected the participation rate through various channels. There are about a million discouraged workers who have dropped out of the labor force; Social Security Disability payments are up for the 55+ cohort, which typically takes those workers out of the job hunt; and a weak labor market can nudge young people back to school. But the decline in participation is mostly a combination of demographics and scholastics. We're entering the workforce later, staying longer, and getting older. The president can beg Congress to spend/cut/deregulate or whatever your particular policy-verb-of-choice may be, but it's fairly clear that we're up against mighty forces—age and education trends—that will resist quick fixes. *The calculations done by demographers are a little more complicated than this, partly because they incorporate (a) expected rising participation among old people and (b) expected falling participation among young people.